Universal headlight spotlight for motorcycle, Honda, Yamaha, Kawasaki, Suzuki, BMW and KTM, Dirt bikes, ATV, UTV cruisers,boat, cars, trucks etc. THREE MODES AVAILABLE,IMPROVING VISIBILITY-High beam, low beam ,strobe flashing.extremely bright, even in the daytime,at night or in bad weather.The flux is 3000LM and the projected distance is about 100 meters to 200 meters. BUILD IN THREE MODES OPERATIONS - HIGH BEAM,LOW BEAM AND STROBE FLASHING-The High Beam will be on,when you firstly turn the switch off and then on.The Low Beam will be on,when you secondly turn the switch off and then on.The Strobe Flashing will be on ,when you thirdly turn the switch off and then on. EASY TO INSTALL,CONTROL BY THE SWITCH OFF - Both the Red cables of the double U7 Headlights is connected to the Blue cable of the Switch. (The other cable of the Switch is connected to the Positive Electrode of your Vehicle).Both of the Black cables of the double U7 Headlights is connected to the Negative Electrode of your Vehicle.Both of the Yellow cables of the double U7 Headlights is for the Angle Eye Halo Rings,which is connected to the Positive Electrode of your Vehicle. HIGH-QUALITY,LONG LIFE TIME,LOW POWER CONSUMPTION - Made of high quality LED chips.Made of Die-cast Aluminum Housing .PMMA lens.Input Voltage: 12V-80V DC, 15W(actual power). 3000LM.Service life over 50,000 hours.Angle eyes light:White Green Blue Amber Red (available).IP68 waterproof.headlight life no maintenance, environmental protection aluminum alloy casing. 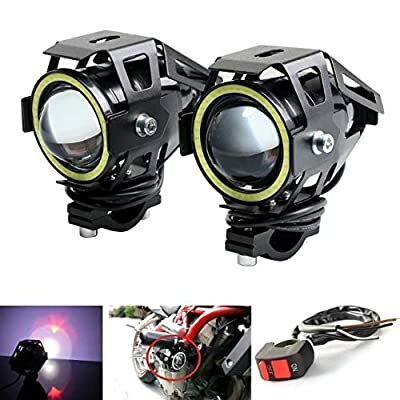 WHAT YOU WILL GET AND HIGH QUALITY GUARANTEE-The package comes with 2x LED U7 Motorcycle Headlights,2x Bracket,4x Hexagonal Screws.2x Hexagonal Wrench.And 1 Switch as a gift.We promise to offer good quality products to make you satisfy with.